There are several manuscripts claimed to be letters sent by the Islamic prophet Muhammad to various rulers. In this video series, a YouTube user claims that scientific evidence supports that they are genuine and original. With regards to the authenticity of that letter, there were some studies done on it. A technical study [...] was done usings microscopes [and] ultraviolet light. Most Muslims have not ever seen these letters, they are not aware they exist and they are not aware of the scientific studies that have been done on these letters that prove - or give us strong evidence to believe - that they are original. Have such studies been done? Do historians accept them as originals? See the thesis ORAL TRADITION AND SCRIBAL CONVENTIONS IN THE DOCUMENTS ATTRIBUTED TO THE PROPHET MUḤAMMAD by Sarah Zubair Mirza, Department of Near Eastern Studies,University of Michigan, 2010. To Serjeant, their standardized contents and ideology make these letters suspicious. Though the letters contain conventional phrases found in the Prophet’s letters to the Arabian tribes, the style seems too “sophisticated,” as if phrases were taken from documentary material available to the redactors. Serjeant suggests that these letters were created in the age of the Umayyad Caliph ‘Umar II (99-101/717-20), who is credited with writing to the princes of Transoxiana, the King of Sindh, and the Byzantine Emperor Leo III, to submit to Islam. As for any surviving material traces of documents written by the Prophet Muhammad, beginning in the late nineteenth century, a number of “original” Prophetical documents (mostly on leather) came to light. These all fall within the tradition of the Prophet’s letters sent to foreign rulers, and their texts correspond with the redactions in literary transmission. 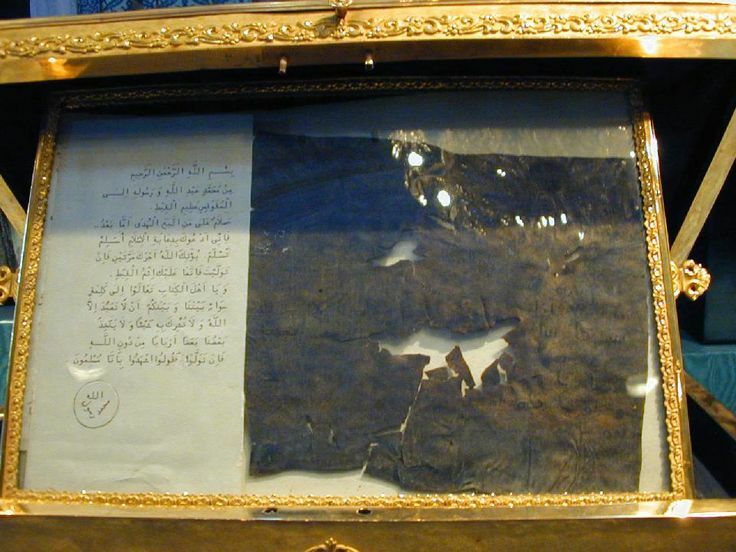 Four of the leather Prophetical manuscripts (letters addressed to al-Muqawqas, al-Mundhir b. Sawā, al-Ḥārith b. al-Ghassānī, and the “false prophet” Musaylama) are now housed in the Pavilion of the Sacred Relics, in Topkapı Sarayı, Istanbul, where they are not on permanent exhibition, and 2004 saw the first publication of images of them by manager Hilmi Aydin, while the remaining documents, reported in Arabic newspapers at the time of their discovery, have now disappeared from view. This chapter will present a palaeographical analysis based on published images of seven of the discovered manuscripts, which will be presented in their order of discovery. These include the letters addressed to: 1) al-Muqawqas, 2) al-Mundhir b. Sawā, 3) al- Najāshī, 4) Hiraql, 5) Kisrā, 6) the sons of Julandā, and 7) al-Ḥārith b. al-Ghassānī. The letter to al-Muqawqas of Egypt was found in 1850 by French Egyptologist Étienne Barthélemy in a monastery at Akhīm in Upper Egypt. It was first published along with a letter from C. Belin dated Oct. 3, 1852 in the Journal Asiatique in 1854. K. Öhrnberg in the second edition of the Encyclopedia of Islam states that the Prophet’s embassy to al-Muqawqas is considered legendary, and that the leather letter was recognized as inauthentic based on historical and paleographic considerations. In the modern age the Prophetical documents have had limited success as relics. The manuscripts that have surfaced were dismissed early on by Western scholars as forgeries based on historical considerations and palaeographical grounds, while the current locations of the manuscripts in the Islamic world are little-known. It's not easy to summarize this over 300 page thesis, let alone scratch the surface of the 700 references. But clearly this is the place to start if you want to seriously study the letters. There is no indication that any of the supposedly-original letters of the Prophet, all "found" in the last 200 years, are actually physical original letters. Not the answer you're looking for? Browse other questions tagged history religion islam .